Understanding property life span is critical to investment decision making. Given that estimates can vary based on a multitude of factors, it is equally important to understand commercial property life span factors. In this article, we take a look at common factors affecting Boston commercial properties. The environment and weather play a major role in the life expectancy of buildings in the Boston area. Being near the ocean, commercial buildings are subject to winds and salt in the air. Additionally, during the winter months, there’s snow, ice, and frigid temperatures to contend with. Commercial buildings may also be subject to pollutants from nearby businesses such as industrial operations, airports, etc. All of these contribute to external wear and tear on buildings in Boston. Internal components of a building are also subject to wear and tear from environmental factors. It is rare that the air in a building is dry and clean. Outdoor air often makes its way indoors. Additionally, heating and cooling systems can impact building materials over time through its air quality and temperature. Business operations are another important factor. Businesses that use chemicals or high heat, for instance, will affect internal building components differently than ones that do not. How a building is used is one of the most important life span factors. High usage naturally causes quicker wear and tear. However, vacant buildings can be a problem too as some systems degrade from lack of usage. Some buildings were originally designed for a certain use and have since been adapted for other types of businesses. This is certainly common as industries change over time. How might this impact its life expectancy? Most commercial buildings in Boston are very old. Some materials may have extended lifespans whereas others may be limited. The construction and design of a building can determine when repairs and updates will be needed and at what cost. Will certain historical features need to be maintained? Are cheaper and higher quality alternatives currently available? 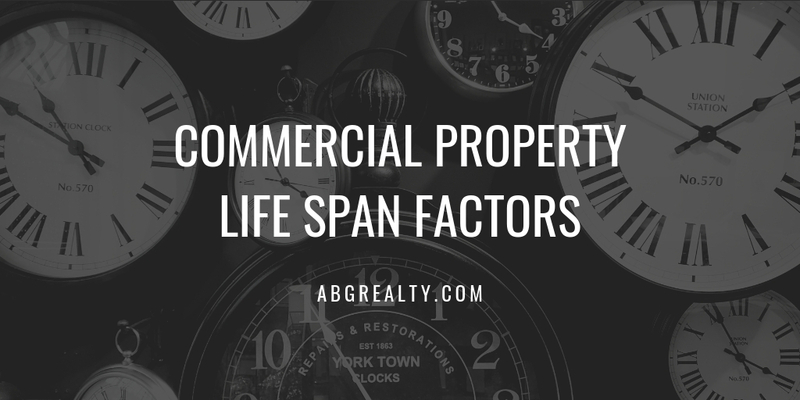 These are all important commercial property life span factors. We’ve discussed environmental, usage and design factors, but we’re leaving out one very important consideration: maintenance. The maintenance history of a building should be closely reviewed. It not only provides insight into the cost of building upkeep but also into the diligence of previous owners and how that may extend or shorten a building’s life span. Maintenance essentially ties together many of the other factors mentioned above. For instance, a well-designed building with high usage may be a better investment than a poorly designed building with low usage. None of the above factors can be considered independently as they all inter-relate and can determine future cost and profitability of a property. If you are looking to purchase a Boston commercial property, contact ABG Realty for assistance. We can help you evaluate property life span factors, market conditions, and other information essential to your investment decisions.